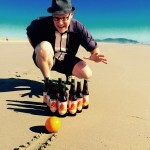 With Washington state’s mammoth apple orchards and the Columbia Gorge’s huge pear groves providing ample supply and new cider-specific apple orchards springing up all over Oregon, the hard cider boom is on. Oregon cider makers now number 57 statewide from only about a dozen five years ago. This ranks Oregon fifth in the country according to the Cider Guide. Oregon’s agricultural underpinnings create a perfect opportunity for close relationships between cider makers and apple orchardists in a state where farm to table and drinking local are deeply held Oregonian values. Half the apples in the United States are grown within 300 miles of Portland. It’s Monday, which means Peaks and Pints offers a cider flight. 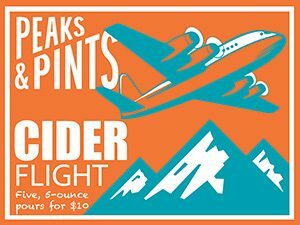 Since we have Oregon on the brain, enjoy Peaks and Pints Monday Cider Flight 11.26.18: A Flight of Oregon Cider. 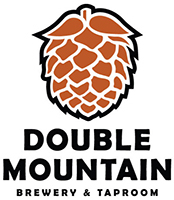 Double Mountain had long toyed with releasing their own hard cider, occasionally featuring housemade cider on at the taproom made from owner Matt Swihart’s own apples. The brewery finally releases its own Dry Cider in December 2017, blending freshly harvested heirloom apples from Double Mountain Orchards and Hood River Newtowns, Braeburns, and Hanners for old world complexity. Double Mountain gave it plenty of time to dry out and develop the aromas of juicy pear, lychee, green fruit, and chamomile. It finishes tart, crisp, dry and quenching. When his North Portland neighbor begged him to take his backyard apples off his hand in 2004, Nat West began experimenting with fermentation, turning the small green apples into hard cider. His friends went nuts. West would go on to hold weekly free cider parties at his house, experimenting on his friends, which ended up at 50 or so people. In the summer of 2011, West launched Reverend Nat’s Hard Cider, most likely the only cidery in Portland. This cider is a blend of fermented fresh apple juice sourced from Eastern Washington and unfermented fresh pineapple juice. A touch of cinnamon, cloves and allspice is added. The spice and pineapple hit the nose and tongue with notes of green apples and pear. Delicious. WildCraft Cider Works, Eugene’s first cidery, uses whole fruit for seasonal small batch ciders naturally fermented without artificial flavorings and added sweeteners. Their flagship ciders are made from Eugene-sourced apples. They also feature craft beverages created with pears, blueberries, plums, cherries, elderberries and, in the case of this cider, elderflower and quince. Fans of floral aromatics will dig this one. Expect huge flowery aromatics that kick up similar characteristics from the cider’s fermentation. It’s easy-drinking, but complex. Friends and winemakers Anne Hubatch, Nate Wall and Kris Wall decided to partner to craft artisanal ciders utilizing winemaking techniques at an urban ciderhouse, and Alter Ego Cider was born. Anne has been at the forefront of urban winemaking with Helioterra Wines, Whoa Nelly Wines and Guild Winemakers. Nate also has several years of winemaking experience, but additionally has been making cider for the past three years for one of the Northwest’s largest cider producers. Anne and Nate bring a winemakers focus on nuance, delicacy, and depth to their small batch production cider. Their blueberry and pomegranate cider, The Guardian Angel, celebrates Northwest summer berries. It offers deep garnet purple color, brambly berry notes and fresh fruit characteristics of both the apple and blueberry, with hints of pomegranate added for a zippy kick. This cider is semi sweet, and perfectly balanced and refreshing. 2 Towns Ciderhouse in Corvallis started out of a 1,000-square-foot space in 2010 and produced 30,000 gallons the following year. By 2014, 2 Towns built a new production facility in a 15,000-square-foot space because they’d outgrown the one they built in 2012. The cidery’s traditional French-style cider, Cidre Bouché, is a lush and vibrant blend that’s composed of juice pressed from hard-to-find heirloom bittersweet and bittersharp apples. The wild-fermented Cidre Bouché comes across the tongue with a perfect accent of oak tannins and sweetness on the finish. The slight sweetness is from a difficult fermentation-stalling technique called keeving, which 2 Towns cidermaker Dave Takush learned in France. Cidre Bouché offers a heady, full-apple bouquet rare in dry cider, with Normandy funk on the finish.